10Micron GM1000 HPS mount represents today the most advanced choice for many demanding amateur astronomers, as it combines all the exclusive 10Micron technology, with absolute encoders that allow unguided positions, with optimal weights and dimensions for those who do not have a fixed position. Movements are driven by two servo brushless motors, with timing belt reduction having zero backlash. Both axes feature a classic worm – wormwheel pairing. The wormwheels are made of bronze (B14), with a diameter of 125mm and 250 teeth, while the worms are built of alloy steel with a diameter of 20mm. The axes themselves are made of 30mm diameter alloy steel, for the maximum rigidity. 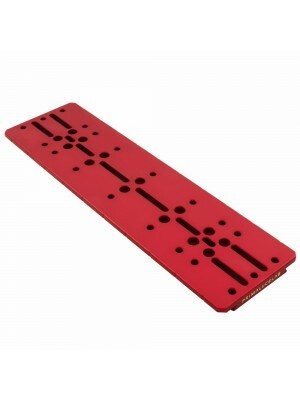 The double dovetail mounting plate guarantees the maximum compatibility with many telescope manufacturers. The electronics is housed in an independent control box, easily removable. The connections of motors, encoders and hand pad feature security lock screws. The mount can be controlled using the included hand pad, without connecting an external PC. 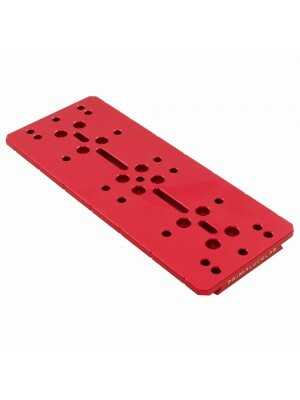 The keypad is built in order to maintain the maximum readability in all lighting conditions. Both the display and the ergonomic keys, allowing for the use of gloves, feature a red backlight. An heater keeps the display warm for usage below freezing temperatures. The mount can be controlled using the most common software packages by connecting it to a PC with the RS-232 serial port or the Ethernet connection, via the proprietary 10Micron ASCOM driver or the Meade compatible command protocol. Furthermore, a dedicated software (also included with the mount) can be used to create a “virtual hand pad” replicating exactly the functions of the physical hand pad. The RS-232 port can also be used to control an external dome. This flexibility makes the GM1000HPS an ideal mount for observatories and remotized observing sites. The object database contains many star catalogs and deep-sky objects up to the 16th magnitude. Solar system objects can be tracked so that their motion is compensated with respect to the stars. You may load orbital elements of comets, asteroids and artificial satellites into the mount, so that these objects can be tracked directly using the hand pad (without any external PC). Pointing is made accurate through the usage of a model containing up to 100 stars, which allows for the correction of the classical polar alignment and conic errors, and also of the most important flexure terms of the optical tube. In this way it is possible to obtain pointing accuracies of the order of 20 arcseconds RMS. The same model can be used in order to obtain the maximum tracking accuracy, compensating also for the atmospheric refraction (depending on the local atmospheric pressure and temperature). A series of auxiliary functions is provided to help the user for quick aligning the mount to the celestial pole. You may save and recover the alignment data of different observing sessions. This function is very useful if you have many instruments in different setups, each one requiring different flexure corrections. Tracking through the meridian, a typical problem with german mounts, is solved allowing for tracking for up to 30° past the meridian (configurable), in both directions. In this way any object can be tracked for at least four hours. The tracking accuracy makes autoguiding not necessary for many uses. The absolute encoders on both axes allows to obtain a typical tracking error below 1 arcsecond. 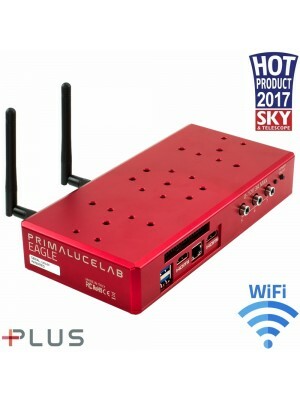 It is possible to autoguide anyway, using the ST4-compatible port or through the serial/Ethernet connection, with a guide rate configurable from 0.1x to 1x. The guide rate can be automatically corrected for the declination of the target, so that there is no need of recalibrating the autoguide when observing at different declinations. Designed for field use, the GM1000HPS is easily transportable. The main body of the mount, without the counterweight shaft, has a weight of only 19.5 kg – 43 lbs. Other functions of the mount are designed in order to obtain the maximum flexibility in the most usage conditions. The mount can be switched on and off using the dedicated connector on the control box panel. You can use the electronic balance functions in order to balance your instrument without unlocking the clutches. The mount can be parked in different user-defined positions. An external dome can be controlled directly using the RS-232 serial port, avoiding the need of using a dedicated external PC. Once configured with your instrument parameters, the firmware is able to make all the calculations required for positioning the dome slit in front of your optical tube, for almost all instrument configurations. Tracking through the meridian, a typical problem with german mounts, is solved allowing for tracking for up to 30 past the meridian (configurable), in both directions. In this way any object can be tracked for at least four hours. The tracking accuracy makes autoguiding not necessary for many uses. The absolute encoders on both axes allows to obtain a typical tracking error below 1 arcsecond. It is possible to autoguide anyway, using the ST4-compatible port or through the serial/Ethernet connection, with a guide rate configurable from 0.Ix to Ix. The guide rate can be automatically corrected for the declination of the target, so that there is no need of recalibrating the autoguide when observing at different declinations. Designed for field use, the GMIOOOHPS is easily transportable. The main body of the mount, without the counterweight shaft, has a weight of only 19.5 kg – 43 Ibs. Other functions of the mount are designed in order to obtain the maximum flexibility In the most usage conditions.